During middle age, the divination, fortune telling and even collecting herbs became a dangerous activities as the churches sought to persecute witches. Yet, women then were no less interested than now in doing a little fortune-telling about their love lives, their finances and their fates. Quietly, secret knowledge was passed from woman to woman about the secrets revealed through reading tea leaves. This was a form of divination that could be practiced at home, with no special equipment and without causing suspicion. 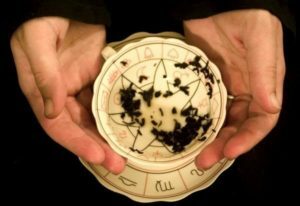 Today the tradition of reading tea leaves is much the same as it was ages ago–minus the element of danger. Ordinary tea cups were used — the lighter the better so as to more easily read the leaves. 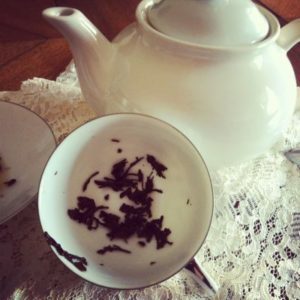 Loose tea, chamomile, peppermint and other herbs were used. Two women would sit quietly, each thinking about a situation she hoped to understand. Each would swirl the cup gently from right to left, until it felt clear that it was time to stop. Then, they’d sip the tea until the cup was nearly empty. Once again, they’d swirl the liquid right to left a few times. Finally, they’d exchange cups and read for each other, using the shapes found in the bottom of the cup to make an interpretation. Another version turns the nearly empty cup over into the saucer to read the leaves from the saucer. This was more obviously divination, so if the women were afraid of being observed, the leaves were instead read discreetly from the cup. Whether you choose to read the leaves from the cup or the saucer, once only the leaves remain, simple shapes can be observed. If the shapes are reversed when facing the reader, the interpretation is reversed. For example, if the reader sees the image of pig (success) and it’s upside down from her perspective, the interpretation is failure. The reader uses her intuition to make the reading. If there is more than one shape, the shapes have to be interpreted together. For example if a boat and a moon are seen, the interpretation might be for a journey whose results may be based on an illusion. Use your immediate associations–the first thing that pops into your head– with the symbol to get the perfect reading for yourself. . If you think – oh, it looks like an otter. And your first association is wet and slimy, go with it. Don’t change your reading by saying, but oh, they’re so cute, so it must be good. Trust your own gut feelings, they’re trying to tell you something.